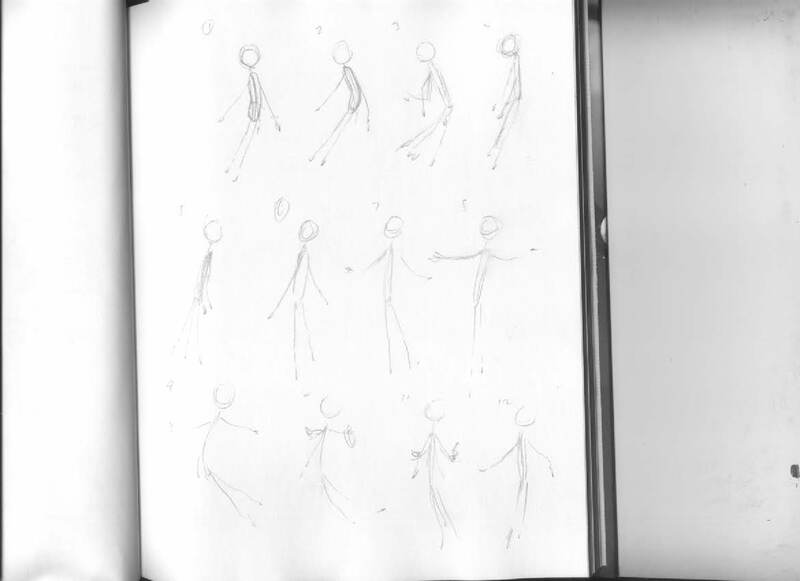 Animation Production Diary – What’s the collective noun for a group of ghosts? The ghosts, as I call them, first appear in scene seven to correspond with the line; ‘…when she thought about the teenager she had been’. They represent an attempt to express a younger possible self, the adult looking back at herself with compassion, and as such a gateway to possible contentment. One of the ghosts will join the Melancholic Wife in the darkness in scene eleven as a symbol of the connection to this gateway out of the blackness so it felt important to keep them feeling light and unburdened by the weight of gravity. They needed to be instilled with a sense of carefree joy to contest the heavy, laden aspect of the dark thoughts. My first ghost pencil test with subsequent digital inks. A second spinning ghost, the pencil test for this was drawn as thumbnails in an A5 notebook as seen below with the next ghost. An example of the pencil thumbnails for the ghosts along with an inked test of a ghost rising with a slight turn then settling. All of these ghosts were combined for scene seven with the timings shifted slightly on the same actions to differentiate, the ghost rising animation was re-used the most because of it’s various, differing actions and longer length. The finished scene with layers of ghosts added in. I changed the opacity on a downward scale from the front to the back of the scene.